The best vision I’ve heard belongs to Elon Musk. His vision for SpaceX is “humans will live on other planets”. The mission, then, is to revolutionise space technology. The left is Mars today — a red baron planet. The right isn’t earth. 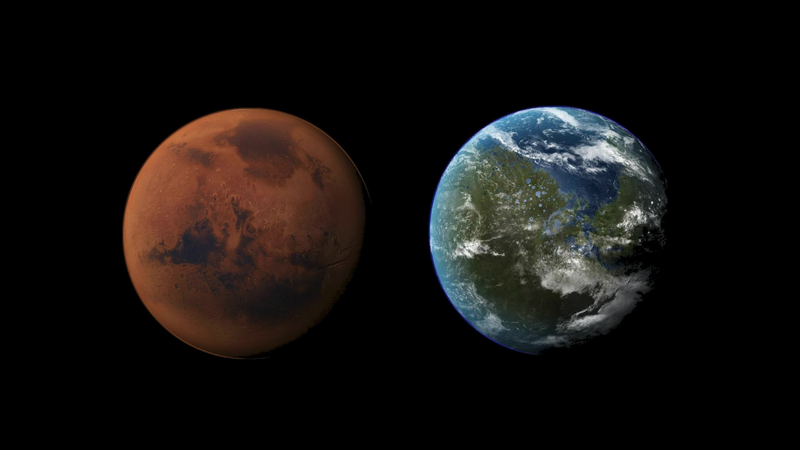 It’s what Mars might look like once Elon’s finished terraforming it. You can imagine walking in to the office each day, seeing those images, and being massively inspired. We’re building another freakin’ planet! In fact, inspiring visions are how you pay for your best people. In the early years, you can’t afford market salaries. You pay with vision instead. Why should someone on half a million dollars at a massive tech company come and work for you? You have to inspire them that it’ll be worth more than money. Compare the vision of SpaceX with that of Virgin Galactic. Virgin’s mission is to “open space to humanity”. Their mission is “suborbital tourism & satellite launches”. Which company are you working late for? Big visions aren’t limited to space companies. In a recent workshop, I met a very interesting education company. After thinking about what their vision or mission might be, we arrived on “to make ethical humans.” I almost joined on the spot. I have more to say about visions, but for now I just want to highlight how important they are. They inspire the best people to join you, and also ensure you all head off in the right direction. So, if you massively succeed, in 10 years, what will be different about the world? Furthermore, how could you dramatise that vision in your office?